*a layout using pencil lines sketch 120. not sure about it as it feels too plain for me..i overexposed the photo..its a snowman, honest. *this is my go at 52Q question 5. see the flickr group for more inspiration. *braved the crazy snow to go to the cinema and see 'hes just not that into you'. i nearly fell asleep. i thought it was too long and too slow to start. i should have seen 'the secret of moonacre' instead! *saw this on post secret. i love it. 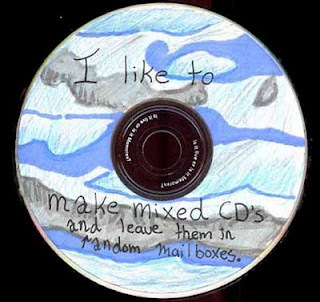 guerilla mix cds! I Love the snow, not driving in it, but love how it looks. Beautiful LO!